During our stay at Station F, we met a lot of interesting startups. One of the few we decided to feature on our blog is Freshr. 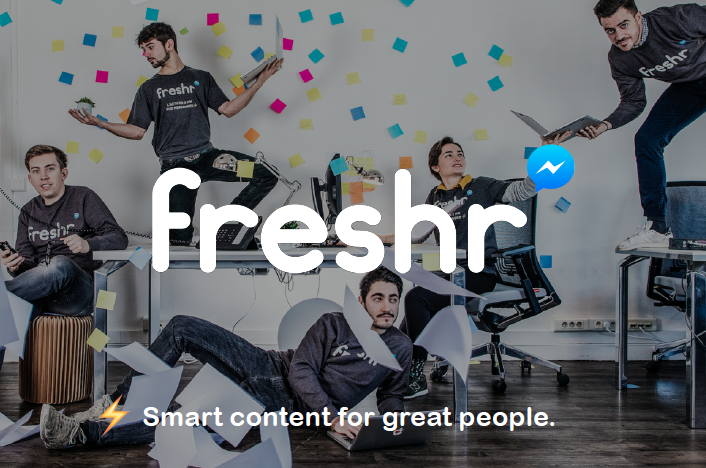 Freshr offers a news curator bot available on Messenger. We met with Romain Torres, one of the co-founders of Freshr, to understand their story. Could you present yourself and tell us what you’re doing at Freshr? “Dylan Fournier and I met and became friends 6 years ago, while we were still in Business School. We launched multiple projects together during our studies, and one was Major Rocket, a concierge service. Users could ask for specific services through SMS, like flowers or wine delivery. We worked with freelances to provide a wide range! After 8 months, we realized that we were targeting a really small audience of wealthy people, whereas our goal was to reach as many as possible. We realized at the same time that many of our users were asking for information about the news of the day, when they could ask about anything. That got us thinking, and we decided in February 2017 to launch a service dedicated to giving the news. Our users could choose which topics they wanted to follow, and our goal was to send them 4 relevant links every morning. At the beginning, we were doing everything manually, from picking the article to sending the SMS. This experiment lasted a month, and was a huge success, if quite tiring! We decided to continue the adventure and officially launch Freshr on Messenger in March 2017, by creating a chatbot to automate the process. Why did you choose a chatbot for your product? “With the Internet, there is an overabundance of news, and it can be tedious to filter the interesting content. We wanted an interface as simple as possible, where someone could select of few topics of interest and then automatically get good articles related to those subjects every day. Most importantly, we have always been driven by our community. As we are targeting the 20-35 years-old age demographics, it was obvious for us to position our product on Messenger. Everyone is using it: it’s a great messaging tool with a top-notch user interface. Who is using your chatbot? “Most of our users are graduate students or young graduates. They have a strong appetite for worldwide news and they use Messenger in their day to day life. The chatbot was really well received: we have really good retention and engagement rates. Our users spend time speaking with the bot, and more importantly, they come back. We’ve already passed the 100 000 users bar! We spend a lot of time contacting our users to gather their feedbacks. For many of them, the main benefit is the ability to always be informed without having to spend time filtering what’s interesting. How did you discover SAP Conversational AI? “We were trying to reach out to developers to improve our chatbot. We don’t really have a tech profile, but were interested in artificial intelligence. We heard about SAP Conversational AI and their NLP, and we though: “hey, it’s free, collaborative and it’s a successful French startup, let’s give it a go!”. We didn’t even try other chatbot solutions. What are the main benefits of a chatbot for you? “It’s definitely the automation. Before using NLP, we were the algorithm finding the best articles for our community, so not very scalable… Our bot receives a few million messages per month, imagine if we had to treat every one manually! AI brings powerful tools to process large amounts of data really easily. Now the chatbot understands what the user wants, and automatically replies with appropriate content, no matter how many conversations are happening at the same time. That’s awesome! Also, as the bot lives in Messenger, we can analyze the conversations in real-time. It allows us to determine what features we need to add, or to keep track of how new features are received. How did you define the personality of the chatbot? Do you have any advice for someone who wants to build a chatbot? “My main advice would be to really think about the why. Why do you want to build a chatbot? The idea is to create an interface, a medium, that brings value to the user. If it goes well into a conversation, or if you want to have bring a natural human-like touch, then a chatbot is a great solution. But you have to make sure a bot is the right fit. Don’t build a bot just to build a bot! Also, don’t limit yourself. It’s not because you don’t know a particular technology that you can’t use it. For the first month, we didn’t have a chatbot, everything was done manually. Then, we decided to build the chatbot ourselves. Six months later, we recruited the team’s first developer and finally built the first version of the bot in Python. We’ve been recruiting developers and data scientists ever since! You can try out Freshr on Messenger or visit their website. Many thanks to the team for their valuable insights! Share your thoughts in the comment section, and happy coding!